Found in southeastern Brazil in Rio Grande do Sul and Rio Parana. This region has a sub-tropical climate with relatively hard winters. Similar to sexing regular apple snails. These are separate sexes, NOT hermaphroditic. In the male snails it may be possible to see his sheath from his shell opening. Will mix with virtually any other non-predatory aquatic animal. Do not keep it with Puffer Fish or Loaches, as they will eat the snail's antennae and try to bite away the shell to get at the snails flesh. Other aggressive fish such as Cichlids, even Bettas, may try and nip at it's antennae. Eats algae, some aquatic plants, sinking pellets and flakes and some par-boiled vegetables. It will constantly graze around the tank, and home in quite quickly on any food put in for it. It is a bottom feeder, although it explores all over the aquarium. Must have calcium (GH greater than 8d) in the water and a pH greater than 7.0 or the shell will dissolve and the snail will die. If it is kept at the higher temperature range, it will move around more quickly, but will have a shorter life span of about a year. Do not keep in a tank with an exposed heater, they're not as fast moving as Pomacea Apple Snails and can get cooked if the heater turns on! Any copper or fish treatments in the water will kill it. A peaceful snail and holds it's shell up high when it "walks". Will occasionally bury itself in the substrate, this is natural and they often are more active during the night. The shell is the big give away. Do not mistake it for the Tiger Nerite Snail or Giant Striped Apple Snail, they have very different shell shapes, but similar stripes. 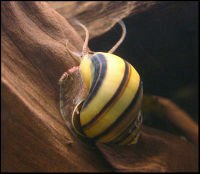 The Spixi has a rounded shell like many of the apple snails. The condition of its shell shows the history of its life. This page was last edited on 8 August 2011, at 03:02.